The WTA yearly schedule features 21 Premier tournaments, four of which are the so-called Premier Mandatory, with prizes exceeding 7 million dollars. 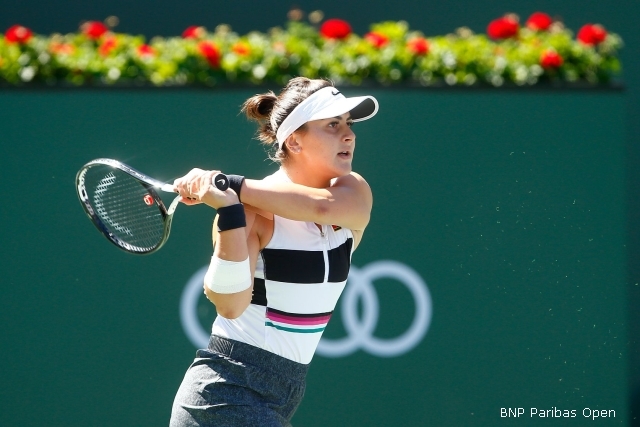 One such tournament came to a close last week in Indian Wells, California, where total prizes stood at some 9 million dollars. The women's singles trophy went this year to 18-year-old Bianca Andreescu. The Romanian-born Canadian player defeated in the final Germany's Angelique Kerber at the end of three sets, 6-4, 3-6, 6-4. She thus became the first player to be awarded a wild card and win the tournament. After this win, Andreescu has climbed 36 positions in the WTA standings, now ranking 24th. For her remarkable feat, we have designated Bianca Andreescu Athlete of the Week on RRI. Bianca Andreescu was born in Mississauga on June 16, 2000, to Romanian parents. At the age of 5 she came to Romania with her family, and at 7 years old she started playing tennis in Pitesti, coached by Gabriel Hristache. She trained with him until she turned 10, then she moved back to Canada. Her first notable achievement came at the age of 13, when she won an important junior's tournament in France. Between 2015 and 2018 she took part in numerous ITF tournaments, winning three of them. In 2019 she qualified to the finals of the WTA tournament in Auckland, New Zealand, knocking out on her way to the final major players such as Caroline Wozniacki and Venus Williams, both former world number one. However she lost the final to Germany's Julia Gorges. Let us also note that Bianca is part of Canada's Fed Cup team.